You know how I mentioned the other that that I was trying to buy a house? Just sort of casually dropped it into conversation without making a big deal about it? Well, I *am* buying a house. Really, truly, a whole house with upstairs and downstairs and an outside too. I have wanted a home of my own since I was a teenager, and really needed my own space for the last 10 years. I have never had my own place. Ever. I am 35. This is a big deal. So rather than the sewing resolutions list I came up with at New Year, methinks the sewing will be things like curtains, sofa covers, more curtains (how many windows in a house?? I hate making curtains….) quilt, curtains, rug? tablecloths, cat bed (fingers crossed), etc. None of those wild ideas about making clothes & handbags. How silly. Even before I saw inside this house, I had started planning the decoration. And believe me when I tell you it needs decorating. 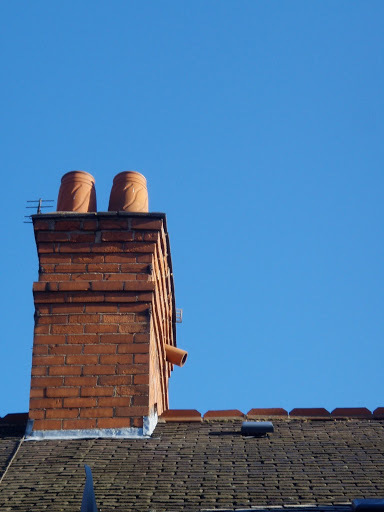 There is a reason I am showing you the chimney pots only… But what could be more fun than a blank canvas? OK, so it’s a dirty beige, bad-wallpaper canvas right now, but we can sort that. It’s going to be good, people, it’s going to be good. congratulations! I have lived in my house for three years now and I'm only just getting to the curtain making part. they are no fun. Congratulations! If you can think of what colors you want to paint your walls – do it before you move in all the furniture. It makes it much easier. Then if it takes a while to get to all the decorating at least you'll feel good about the walls. Enjoy! It certainly will be good. You already have gorgeously rotund chimney pots with a delightful pattern on them! Congratulations Ruth! How wonderful! I'm sure you'll be able to fix it up and make it feel like yours in no time.Looking forward to seeing more pics as you make progress! Go for it!I agree curtain making isn't a lot of fun, but just think how good it will feel to have everything the way you want it! Congratulations – I'm really pleased for you. I like Ruth's roof!Can't wait to see the rest.Curtains are boring, yes, but as someone who usually makes my own, they are wayyy better when they are just what you want! There is nothing to compare with having you very own place.Sure, curtains are tedious, but if you need a little help, I know of a very good book on sewing techniques . . . . ah, that would be the one you wrote!All best wishes. Congratulations! You're going to have such fun. Mind you, we've been in our house for five years, and I still haven't painted all the doors….